It is important to distinguish between bone bruise and osteonecrosis by suspecting and serially performing radiographs and magnetic resonance imaging after shoulder dislocation. 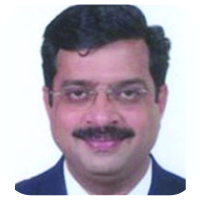 Departmentof Orthopaedics, Lokmanya Tilak Municipal Medical College and Lokmanya Tilak Municipal GeneralHospital,Mumbai, Maharashtra. India. Dept. of Orthopaedics, Suite No. 115, First Floor, College Building, LTMMC & GH, Sion, Mumbai- 400022. Introduction: Osteonecrosis of the humeral head is not a very common entity. It is usually associated with comminuted proximal humerus fractures. We report a rare case of osteonecrosis of humeral head after anterior shoulder dislocation without any fracture of the proximal humerus. Case Report: We report a case of a 24-year-old male who sustained a left-sided anterior subcoracoid shoulder dislocation following a road traffic accident. The shoulder was closed reduced, and a post-reduction radiograph was taken to confirm concentric reduction. At 6-month and 2-year follow-up, the radiographs showed sclerotic changes and magnetic resonance imaging (MRI) confirmed the occurrence of osteonecrosis. This is the first such report in contemporary literature. Conclusion: Osteonecrosis of the humerus head can occur after an anterior shoulder dislocation. It is important to distinguish between the bone bruise and osteonecrosis. This can be done by serially reviewing the patient’s radiographs and MRI. 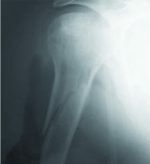 Osteonecrosis of the humeral head is not a common entity. It is usually seen in cases of traumatic 3 or 4 part fractures of the proximal humerus. We report a rare case of traumatic osteonecrosis of the humeral head after an anterior shoulder dislocation. We report a case of a 24-year-old male with a left-sided anterior subcoracoid shoulder dislocation (Fig. 1a) following a road traffic accident. This was the first episode of dislocation. The shoulder was closed reduced by the Kocher’s technique within 3 hours of trauma, and a post-reduction radiograph was taken to confirm concentric reduction. The shoulder was immobilized for 3 weeks (Fig. 1b and c), following which rotator cuff strengthening exercises were initiated. The patient was followed up, after the shoulder was reduced at 3 weeks, 3 months, and 6 months, and then, the patient reported after 2 years. This patient was a non-alcoholic healthy college-going student who was not on any medications. At 6-month follow-up, the left shoulder radiograph showed a sclerotic sector of the head with cortical erosions near the greater tuberosity (Fig. 2a and b). A magnetic resonance imaging (MRI) was done which revealed a geographic area of the anterior part of humeral head with an altered marrow signal, which was iso- to hyper-intense on short tau inversion recovery sequence, with a hypointense rim on T1 sequence. The differential diagnosis was a bone bruise or osteonecrosis of the humeral head. However, due to the sclerotic changes on the radiographs, possibility of osteonecrosis could not be ruled out and this required sequential imaging. The long head of biceps tendon was displaced medially, outside the bicipital groove (Fig. 2c and d), and the rotator cuff was normal. The patient had a stable shoulder with mild pain at the extremes of motion. 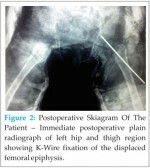 A radiograph of the pelvis with both hips was normal, without any sclerotic changes of the femoral head. The patient was treated with cuff strengthening exercises, and he resumed all routine activities including leisure sporting activities. Bisphosphonate was not administered. At the end of 2 years, the patient had no functional restriction and had an excellent UCLA score. The shoulder radiograph revealed a mixed sclerotic and lytic lesion in the humeral head without any cortical defect and a maintained a congruent articular surface. The greater tuberosity erosions seen on the earlier radiographs became sclerotic without any further undermining (Fig. 3a and b). A repeat MRI of the shoulder at 2 years revealed a 19 mm3×17 mm3×12mm3serpiginous, geographic area, larger in size than the previous MRI, which was consistent with osteonecrosis of the humeral head without any deformation of the articular surface. There was a partial thickness tear with medial retraction of the subscapularis. The long head of biceps tendon was torn and retracted. The rest of the rotator cuff and glenoid labrum was normal (Fig. 3c and d). An MR angiography of the shoulder was performed to know the status of the circumflex vessels (Fig. 4a, b, c, d). It showed attenuation of the some of the branches of anterior circumflex humeral artery, but all the vessels around the humeral neck were patent, but their course was not clearly defined. To enable a better visualization of the arteries around the neck of the humerus and to localize the site of obstruction of the artery, if any, a computerized tomography angiography of the left shoulder was performed at 2 years (Fig. 5a, b, c, and d). 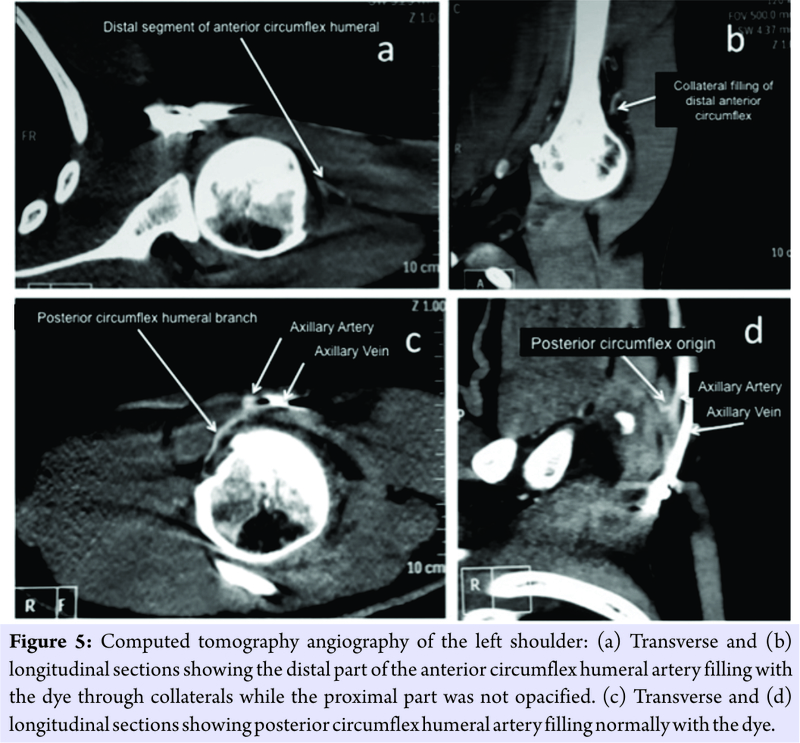 This study reported that the origin and proximal part of the anterior circumflex humeral artery was not opacified while the distal part of the artery was seen filling with the dye through the collaterals. The posterior circumflex humeral artery was normal. On clinical examination, the patient was able to perform 170° shoulder abduction, with a normal scapulothoracic rhythm. The power of internal rotation of the shoulder was 4/5 as per the Medical Research Council grading on the left side, and the power of the rest of the shoulder movements such as external rotation, abduction, forward flexion, and extension was 5/5. The patient was advised biceps tenodesis with subscapularis repair. However, the patient was not willing for the same. The osteonecrosis of humeral head is an entity that is commonly seen in 3 or 4 part fractures of the proximal humerus. 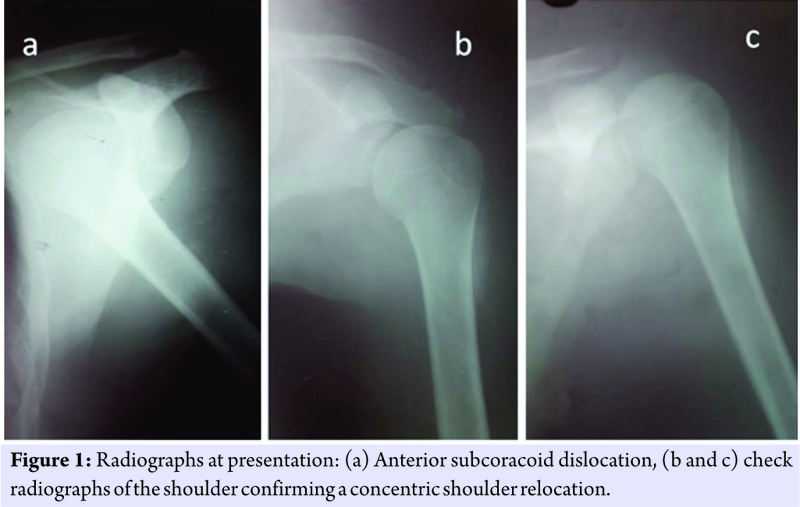 The incidence of osteonecrosis of humeral head after a shoulder dislocation is not very common. There is only one report of aseptic osteonecrosis of humeral head after anterior shoulder dislocation . Despite the paucity of literature, the osteonecrosis of the humeral head is only second in incidence after the femoral head . However, significantly different pathomechanics warrant osteonecrosis of the humeral head to be considered as a distinct entity . The humeral head is not subjected to the same weight bearing stresses as the hip joint. The glenohumeral joint is lesser restraint than the hip joint. 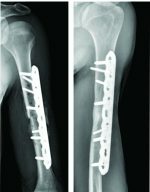 This enables a greater range of motion even in advanced stages of osteonecrosis. The scapulothoracic movement can compensate, to an extent, for the restriction of glenohumeral range of motion. Therefore, the time to intervene for the different stages of osteonecrosis is different for osteonecrosis of the head of femur and humerus. To explain the pathogenesis of osteonecrosis of the humeral head, it is important to understand the vascular supply of the humeral head. It is known, through previous injection studies, that the humeral head has a very rich anastomotic arterial supply . The anterior and posterior circumflex arteries, branches from the axillary artery, supply the humeral head. Between them, the contribution of the anterior circumflex humeral artery is more important. The artery courses laterally under the tendon of the long head of the biceps and terminates by ramifying over the greater trochanter. Another important branch of the anterior circumflex humeral artery is the anterolateral arcuate artery, which ascends proximally into the humeral head. It is the main intraosseous supply and also supplies the lesser trochanter . Obstruction of the anterior circumflex humeral artery could occur due to an intraluminal pathology (as in the non-traumatic causes) or due to extraluminal pathology such asarterial compression. The risk of osteonecrosis increases after an open reduction and internal fixation of proximal humerus fractures due to the iatrogenic damage to the supplying blood vessels during the dissection around the long head of biceps tendon . 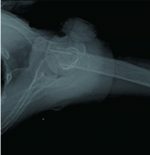 A case of bicipital tendinitis causing osteonecrosis of the humeral head has also been reported . There has been another instance of osteonecrosis occurring after an arthroscopic cuff repair . In our case, the damage to the anterior circumflex humeral artery could have led to osteonecrosis of the humeral head, considering the anterosuperior region of the humeral head being affected. However, further evaluation is needed to probe into the possible etiology for the vascular compromise in cases of shoulder dislocations. The treatment options for osteonecrosis of the humeral head vary widely from a conservative non-operative treatment to core decompression to total shoulder or reverse total shoulder arthroplasty . Non-operative treatment, to enhance the range of motion and to strengthen the shoulder musculature, is recommended for all patients. The patients in the early stages of osteonecrosis (Stage 1 or 2) respond very well to non-operative treatment. The patients who continue to worsen clinically, despite physiotherapy, should undergo a core decompression surgery. It is preferred in Stages 1 or 2 of disease. 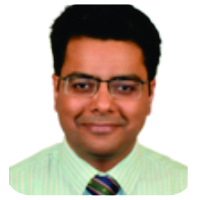 In late Stages (3, 4, or 5), shoulder arthroplasty is the preferred treatment option. In our case, the patient was put on non-operative treatment and he responded well with decrease in pain, improved range of motion, and muscle strength. The other important aspect that is highlighted by this report is that it is difficult, but important, to distinguish between bone bruise and osteonecrosis. If the radiographs are normal with MRI suggesting altered marrow signal, it could be only a bone bruise. However, if the radiographs show mixed sclerotic or lytic lesions in addition to the MRI showing altered marrow signals, there is a possibility of osteonecrosis. The only method to differentiate between the two is sequential evaluation. If serial radiographs show progressive changes and so do the MRI sequences, then it is more likely to be a case of osteonecrosis, rather than a bone bruise. This radiological evaluation is more so important because patients with osteonecrosis humeral head do not clinically present early as compared to patients with osteonecrosis of the hip. To summarize, though uncommon, osteonecrosis of the humerus head can occur after an anterior shoulder dislocation. It is important to distinguish between the bone bruise and osteonecrosis. This can be done by serially reviewing the patient’s radiographs and MRI. In a case of osteonecrosis of the humeral head, non-operative conservative treatment does give good results, especially in the early stages. However, in active patients, we do recommend treatment of associated injuries like performing a biceps tenodesis or rotator cuff repair. Osteonecrosis of the humeral head can occur, though rarely, after anterior shoulder dislocations. On MRI imaging, it is important to distinguish between the bone bruise and osteonecrosis. This can be done by suspecting and serially performing radiographs and MRI. 1. Gaudot F, Gregory T, Augereau B, Masmejean EH. Aseptic osteonecrosis of the humeral head after anterior shoulder dislocation.Eur J Trauma Emerg Surg 2008;34:601-5. 2. Sarris I, Weiser R, Sotereanos DG. Pathogenesis and treatment of osteonecrosis of the shoulder. Orthop Clin North Am 2004;35:397-404. 3. Meyer C, Alt V, Hassanin H, Heiss C, Stahl JP, Giebel G, et al.The arteries of the humeral head and their relevance in fracture treatment. Surg Radiol Anat 2005;27:232-7. 4. 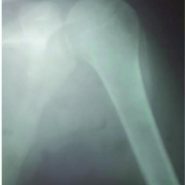 Gerber C, Hersche O, Berberat C. The clinical relevance of posttraumatic avascular necrosis of the humeral head. J Shoulder Elbow Surg 1998;7:586-90. 5. Wiesler ER, Sarlikiotis T, Mavrogenis AF, Kokkalis ZT. Attrition tendinitis of longheadof biceps brachii in relation tohumeral headosteonecrosis: Case report. J Surg Orthop Adv 2013;22:245-8. 6. Dilisio MF, Noble JS, Bell RH, Noel CR. Postarthroscopichumeral headosteonecrosistreated with reverse total shoulder arthroplasty. Orthopedics 2013;36:e377-80. How to Cite This Article: Dhamangaonkar A C, Goregaonkar A B. Atypical Osteonecrosis of Humeral Head Following Anterior Shoulder Dislocation. Journal of Orthopaedic Case Reports 2018. May- June; 8(3): 61-64.